This Saturday, April 6, the family, friends and the community of Tupper Lake will enjoy a fun-filled day of events to help raise awareness for Cystic Fibrosis and to help support Aubrey Sparks' Family on their medical journeys ahead. The proceeds will help alleviate medical costs and travel expenses for the family. The day's events will start at the State Theater, showing the movie “Five Feet Apart”, with showings at 2p.m. and 4p.m. The movie is based on two cystic fibrosis patients that fall in love, even though the hospital rules state they must stay five feet apart at all times. The evening ends at the Raquette River Brewery End your evening from 6p.m. to 9p.m. with music by Slingshot. The entire day is in honor of Aubrey Sparks, who just turned 13 years old on March 2 and was diagnosed with Cystic Fibrosis through newborn screening at birth. Cystic Fibrosis, also known as CF, is a progressive, genetic disease that causes persistent lung infections and limits the ability to breathe over time. 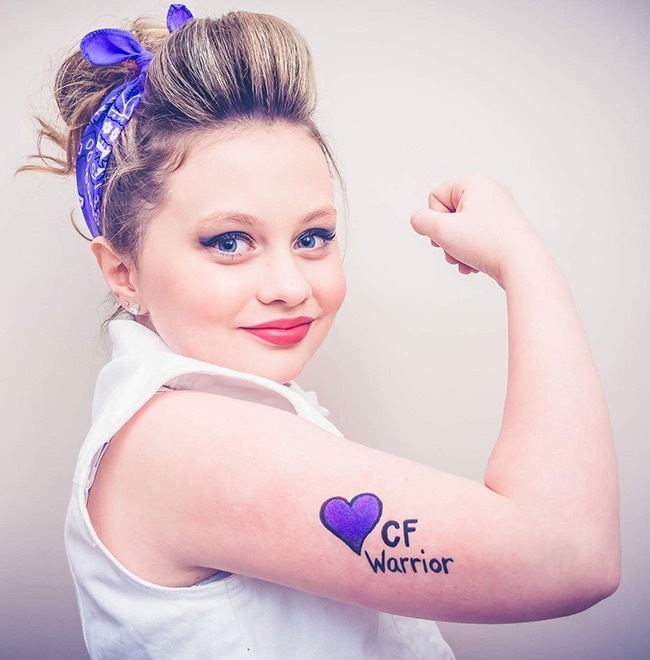 CF is a genetic disorder that affects mostly the lungs, but also the pancreas, liver, kidneys and digestive system. Although there has been significant progress in treating this disease, there is still no cure and too many lives are cut far too short. More than 30,000 people live with the disease in the US. It is a complex disease that affects each person differently. Aubrey was diagnosed through a sweat test and blood test. She is the only daughter of Artie and Meaghan Sparks and has two brothers Taylor, 22 and Anderson, 8. The family was devastated and totally unprepared for the difficult news they had received. After several appointments and some research they had a better understanding of Cystic Fibrosis (CF) and how it may affect Aubrey. Artie and Meaghan became determined to do everything in their power to help Aubrey live a full, happy and healthy life. They learned how to do manual chest physical therapy and administer inhaled medications which became part of every day life. The first year went well and Meaghan stated it seemed as if the CF had gone away. After that things began to change and then came a rough year and a half. Aubrey was hospitalized several times for pseudomonas infection and her weight was dropping at an alarming rate. The doctors encouraged Artie and Meaghan to have a feeding tube placed in her. Unfortunately, Aubrey had complications. The lining of her stomach did not adhere to her intestinal wall. After some time things began to turn around and they slowly began to see the benefit of Aubrey's “tubie,” as they called it. It saved her life, stated Meaghan. Things went well for the next five years. In the fall of 2012, Aubrey started having problems with her sinuses. She has undergone four sinus surgeries because of the sticky mucus from having CF plugged her sinuses almost entirely. The surgeries were beneficial. The past few years have been tough. the family takes it one day at a time. In 2017, Aubrey was approved to try a new CF medication called Kalydeco. She was able to begin the new medication while she was hospitalized in November 2017. She had been doing well until recently when she began having stomach issues. Aubrey is an amazing, strong young lady. She is loving seventh grade. She played on the modified volleyball team this past fall. She continues to play the clarinet in band, and is a member of the chorus. She was recently in her third school play. Aubrey is also a writer for the Lumberjack Lyre and a member of the SADD. This year she also joined the modified basketball team. She has recently been named to the Junior National Honor Society. Aubrey loves to be with her family and hang out with her brothers and cousins Grace and Maddie. She has so many great friends in school. Aubrey is living her life to the fullest and her family is so very proud of her. The family and Aubrey have began the Make A Wish process. Her dream is to go to Paris. Come out and join Aubrey and her friends and family this Saturday.